Willard Chamberlin was a Marine mess sergeant and rifleman who saw action at Okinawa, the biggest battle in the Pacific during the closing days of World War II. He quit high school in 1943, when he was just 17-year-old, and joined the Marines with his parents’ permission. Before the war was over he had three brothers who also served in the Army, Navy and Air Corps. After graduating from cook and bakers school the teenage leatherneck was sent to San Diego where he shipped out aboard a transport for the war zone in the South Pacific. “I was a cook in the 3rd Amphibious Corps attached to a battalion of 155 ‘Long Tom’ field guns, part of the 1st Marine Division. There was a lot of speculation aboard ship we were going to Formosa,” the 84-year-old North Port, Fla. resident said. “We ended up in an LST (landing ship) off the beach at Okinawa. Just before we arrived they told us where we were going, what we were going to do and what was expected of us. “Shortly after we got there a Japanese kamikaze (suicide pilot) came down and hit the water right next to our ship and blew up. The explosion rocked our LST so badly the chains holding some of the 155 millimeter cannons broke and the weight aboard our ship shifted,” he said. “The captain of our LST ran the ship on the beach, opened the bow doors and we stepped onto the sand without getting our feet wet,” Chamberlin recalled. “There was no enemy resistance. Within two weeks Marines had taken the north end of the 70-mile-long island without too much fighting. “I was told to cook some food for the troops. So I set up on the beach and made soup and coffee for the Marines. While cooking on the beach an object flew right by my head and buried itself in the sand at my feet. The object was dug up and we found it was a piece of shrapnel about 20-inches long, 5-inches wide and 2-inches thick. I was told the Japanese had no guns that would fire a shell that size. It was from one of our battleships off shore,” he said. 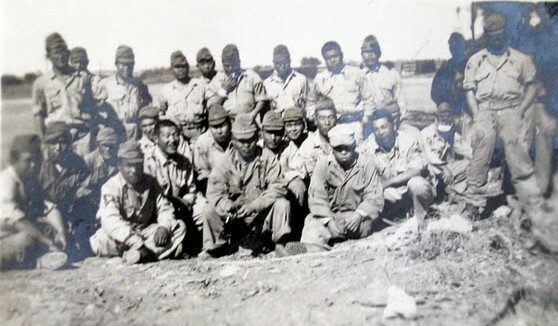 The Marines and Army hadn’t been on the island long when the Japanese Air Force came calling. 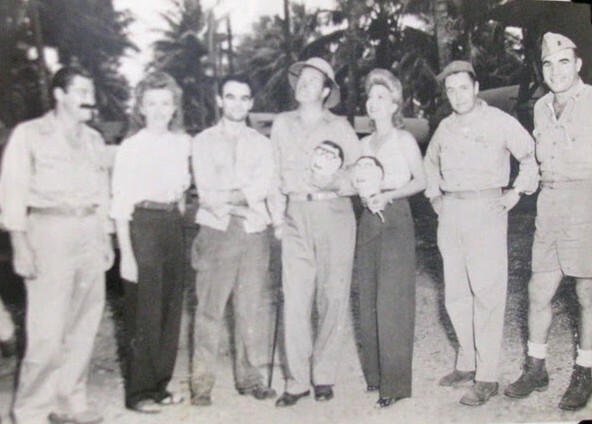 These were some of the Okinawan natives who were wearing Japanese uniforms and worked for the American after the Marines and Army took control of Okinawa. Photo provided. 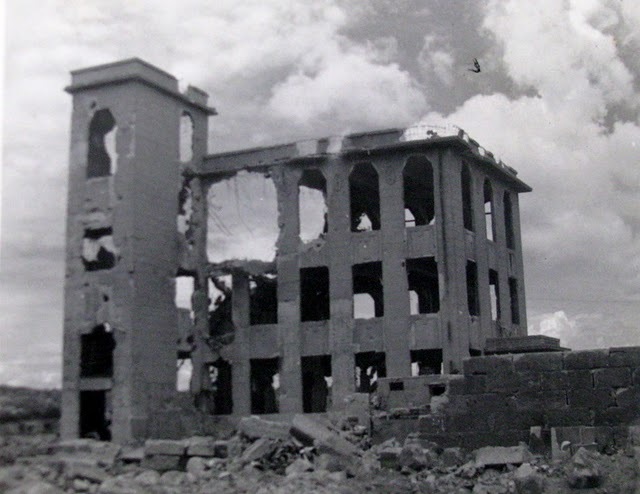 One of the few remaining multi-story concrete buildings left after the 82-day battle of Okinawa. “One of these caves had massive steel doors to protect the Japanese artillery. We couldn’t blow the doors off with our guns. So we drilled into the 20-inch thick steel doors and placed charges in the holes that blew the doors off the front of the cave,” he said. The further south the Marines and Army moved on Okinawa the tougher the fighting got. “The Japanese military headquarters was in a building near the south end that had walls that were 10-feet thick. They also had underground tunnels running off in all directions from this headquarters. “I saw the final stages of the fight for Okinawa that ended up on the beach at the south end of the island. I was on a hill overlooking the beach. The Marines had trapped most of the Japanese that remained on the island in the water. They had no place to go,” Chamberlin said. In the midst of the fighting Lt. Gen. Simon Bolivar Buckner, the commanding general of the Marines on Okinawa was killed by Japanese artillery. “He was the highest ranking general killed in the Pacific. It happened shortly after he walked right by me on his way to the front lines. He was told by a Marine to go no further because they had been in hand-to-fights with the enemy. 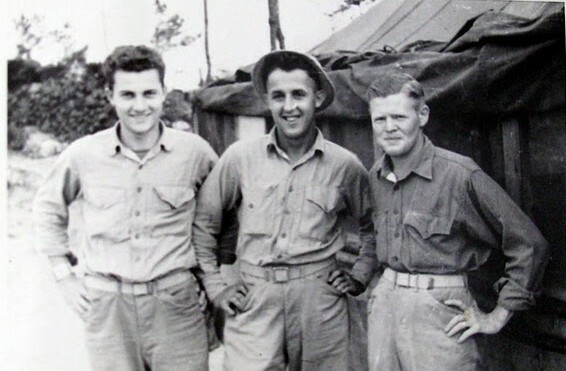 Buckner told the Marine, ‘I’m the general and I’ll do whatever I want.’ He was standing between two coral formations when Japanese artillery round hit and killed him instantly,” Chamberlin said. “Our general, Roy Geiger, took over for Buckner. Although most people think the battle of Okinawa lasted 82 days, it actually lasted an additional 10 days because Gen. Geiger ordered us to clean out any Japanese still left on the island,” he said. Chamberlain would spend more than a year on Okinawa after the battle was over. He didn’t have enough points to go home until May 1946. When he returned to Underhill, Vt., his home where he grew up, he got a chance to play professional baseball for the Philadelphia Phillies. “I signed a contract with the Phillies farm team. I had a pretty good fast ball and a wicked overhand curve ball,” he recalled with a smile. Eventually Chamberlin got into sales and went to work for the L. & M. Machine Tool Co. of Springfield, Vt. He worked for the firm for 36 years until he retired. He and his late wife, Becky, moved to Florida 25 years ago. She died three years ago; they had been married 61 years. They have five sons: Willard Jr., Ralph, Mark, Kirk and Darryl. By the time the 82-day battle was over 12,000 American servicemen had lost their lives fighting on the island and 38,000 were wounded. The dead included 8,000 Army and Marines and 4,000 Navy. The Japanese lost 107,000 killed, which included 12,000 Okinawan conscripts. In addition, approximately 100,000 Okinawan civilians were killed in the biggest battle in the Pacific Theatre of Operations. This story was first printed in the Charlotte Sun newspaper, Port Charlotte, Florida on Thursday, Sept. 30, 2010 and is republished with permission. 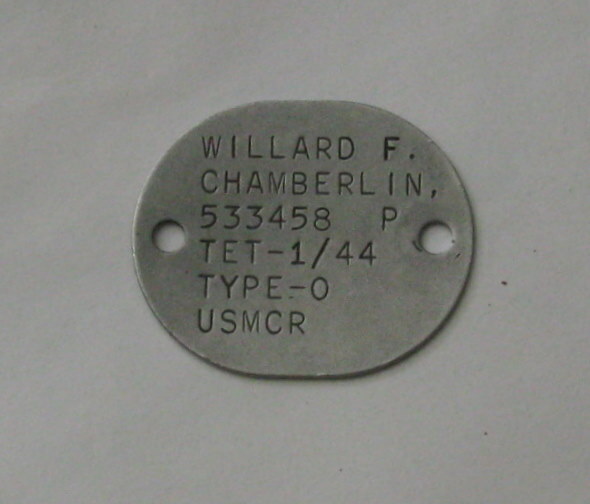 Click here to view Chamberlin’s Collection in the Library of Congress’ Veterans History Project. Click here to search veteran’s records and obtain information on retrieving lost commendations. 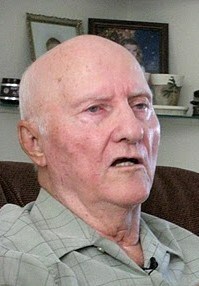 Willard Franklin Chamberlin, 86, of North Port, FL, formerly of Underhill, Vermont, died on Jun. 16, 2012. My name is Jake, I am a Navy corpsman attatched to 2nd MAW and my grandfather was a USMC sgt attatched to 3rs amphibious corps. Im currently trying to do some research about my grand father when I stumbled upon this article. On the off chance you might have known him and can give me some insight on who he was, I would deeply appreciate it if you could get back to me. I will attatch my civilian email. Thank you very much for your time, and God bless. Jake – Don Moore is author of War Tales and interviewed Mr. Chamberlain. Unfortunately, Mr. Chamberlain died Jun. 16, 2012. Please let me know if you know of anyone else belonging to 3rd Amphibious Corps that is still around. On my way to Oki soon so I am curious to see what else I can find out about going there. This is a long shot, but my father was with the 3rd Amphibious. He drove a DUKW and was in the Invasions of Guam and Okinawa. I have some poor quality photos of him with others of the 3rd Amphib. If you had a photo of your Grandfather, then, perhaps I might, by luck, match him up to a photo in my possession. Bob, I have two pictures i can send you but both are of lower quality. If you can provide me with an email i will happily send them to you. His name was Elbert “Bert” Watt. He was on board the USS Quincy before it sunk. My father was stationed with a Don Chamberlain on Guam. His picture is very similar to William Chamberlain. Don was from Sacramento, CA. If so,would like to share his photo(s) with his surviving family. All you need to do to share the pictures is to pass this page on to his family. Does anyone remember Archie Jennings, radioman, III amphibious corps? He was my father, but died in an auto accident in 1952. Looking for someone who remembers him and can tell me a little more about him … Thank you! Good luck to you with your search. I have two pictures of my grandfather. How doI upload them? Is Willard Chamberlin your grandfather? You can’t upload them here yourself. I have to do it on my end. Please email to DonMoore39@gmail.com and if the quality works, we’ll certainly consider it. You also need to give me some information about the pictures – what’s going on in it and who is to be credited for the image. No Willard is not my grandfather. Im trying to find out more about my grandfather and gather any pictures possible asmy grandfather was attached to the same unit. My father, Theodore K. Stigell (Ted) served with the 3rd Amphibious Corps. He never spoke much about his war experiences.